In this workshop, theological school faculty will design, build, implement, assess, and redesign an online or hybrid course to be taught in the 2018-19 academic year. The workshop will be offered as a hybrid experience, blending elements of individual work, three face-to-face sessions, and collaborative work as part of a virtual learning community. 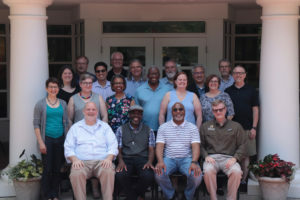 During the first summer, participants will engage in an intensive program that includes online content (developed in collaboration with the University of Wisconsin – Madison), bookended by two of the face-to-face gatherings with peers on the Wabash College campus. 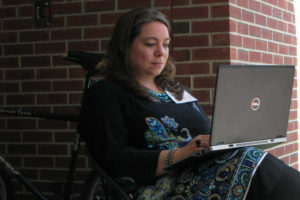 During the 2018-19 academic year, participants will teach and assess the course they designed. In the final face-to-face session during the summer of 2019, each participant will review their assessment information, share best practices, wrestle with deeper issues of pedagogy and sociology of learning, and complete a plan for revising their course. Participants will receive an honorarium of $3400 for full participation in the three f2f and online course sessions. In addition, all participants will be reimbursed for local expenses and travel. Front Row: *Steve Delamarter (Portland Seminary), Valentin Ekiaka Nzai (Mexican American Catholic College), Jeffery Tribble (Columbia Theological Seminary), Tim Westbrook (Harding University). Second Row: Rachel Miller Jacobs (Anabaptist Mennonite Biblical Seminary), *Stacy Williams-Duncan (Virginia Theological Seminary), Catherine Williams (Lancaster Theological Seminary), Carmichael Crutchfield (Memphis Theological Seminary), *Bridget Powell (University of Wisconsin – Madison), S. Tamar Kamionkowski (Reconstructionist Rabbinical College), Kent Kersey (Corban University). Third Row: Kristel Clayville (Lexington Theological Seminary), Elias Ortega-Aponte (Drew Theological School), Lee Beach (McMaster Divinity College), Mariano Avila (Calvin Theological Seminary), Max Lee (North Park Theological Seminary), G. Alan Overstreet (Anderson University). Back Row: Zachary Tackett (Southeastern University), *Tom Pearson (Wabash Center).